Springtime is here and everything’s coming up flowers. Pip beads are Czech glass beads that look like flower petals and are perfect in floral bead weaving designs. They’re also good options for beaded fringe or anytime you want to make dangles on your beaded jewelry. Pips have one end that’s tapered, with a stringing hole that runs from side to side. Use a flower pen (affiliate link) to jot down your bead shopping list, ideas, and anything else that gets you in a springtime mood. Read Beading Trend: Fantastic Florals for inspiration. And here are a few more patterns to start your wheels turning and show you some different ideas using Pips. You might want to download a pattern and make it tonight! 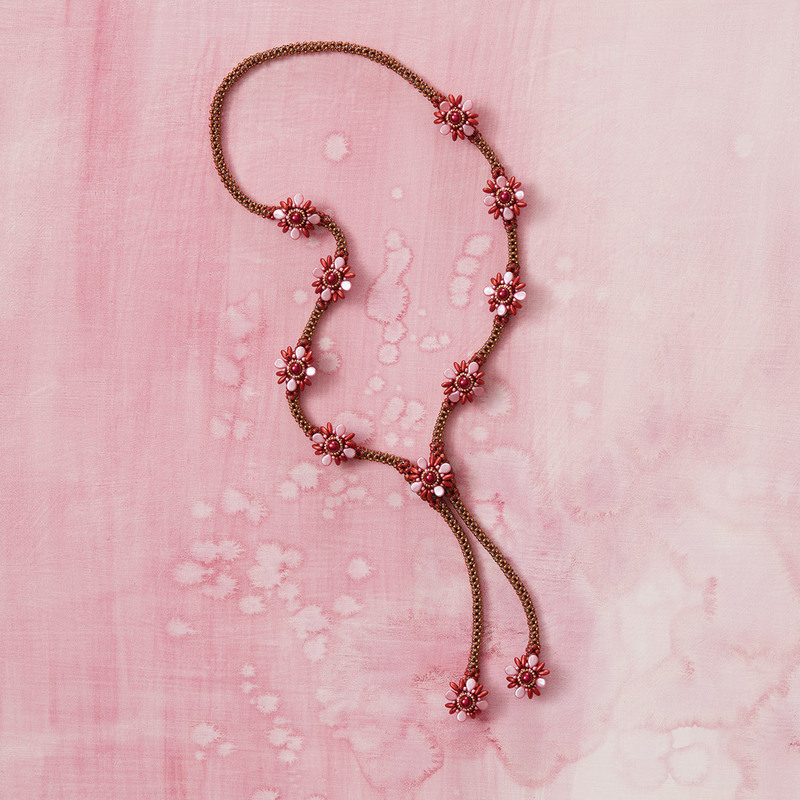 I love the ruffled look of the Pip beads on this Kumi Petals Bracelet by Svetlana Chernitsky. They create a pretty, petal-like effect along the sides. 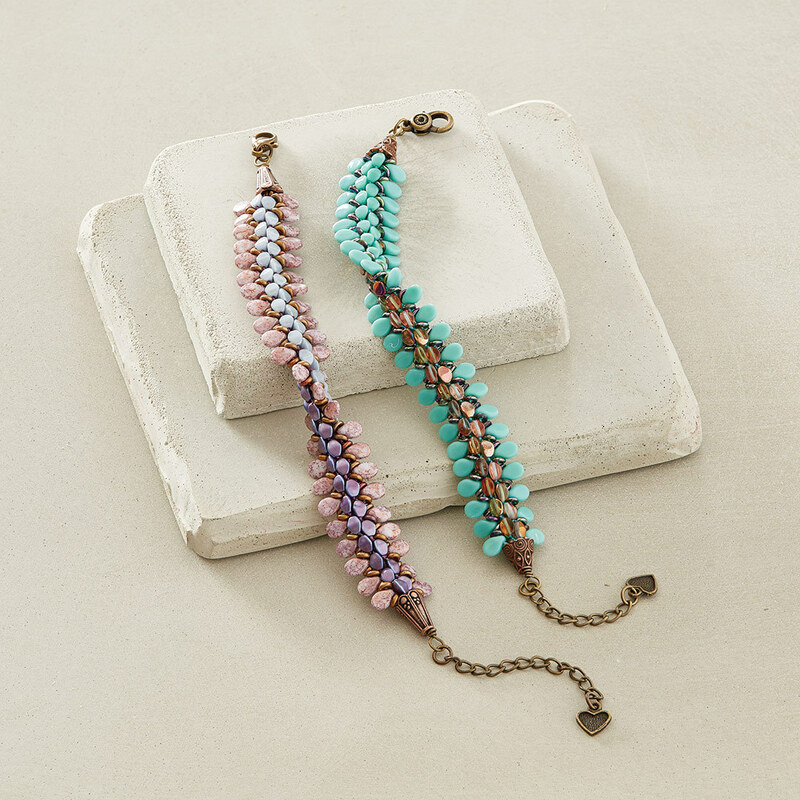 You’ll use kumihimo to create the sinuous, reversible bracelet in springy, sorbet colors. Plus, adding a length of chain at the end is one of my favorite tricks for sizing bracelets. I like the idea of making this bracelet in a variety of colors and then stacking them all together. 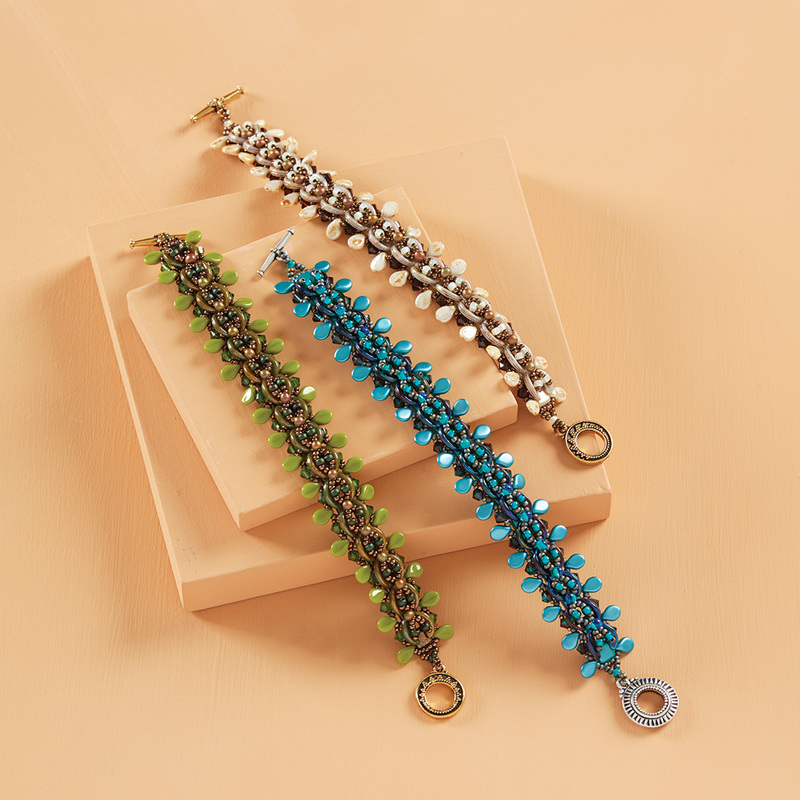 Pip beads add a ton of flair to this fun Pip Pip Hooray Bracelet by Abigail Myer. The main body of the bracelet gets its texture from the variety of beads woven together in netting stitch. You’ll layer three sizes of seed beads, two-hole crescent beads, Japanese drops, CzechMates squares, and crystal bicones. The Pip beads add that little extra something along the sides. Create a pretty bezel for a Lunasoft Lucite cabochon using tubular peyote stitch, seed beads, and Pip beads for an eye-catching Pip Petal Pendant. 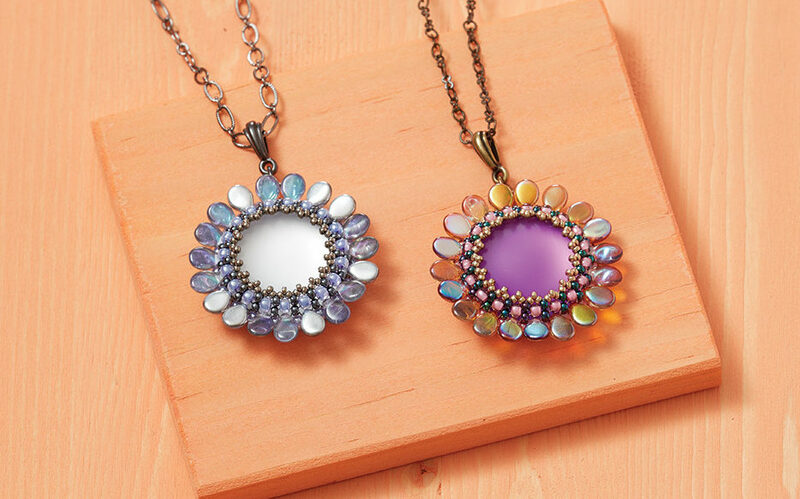 Designed by Kim West, this pendant is a colorful celebration of springtime. I’m tempted to alter the instructions to turn the pendant into a bracelet focal element or a pair of earrings. 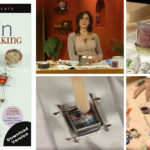 Or, try Evelína Palmontová’s Wild Dahlia Lariat. Stitch a rope of variegated cubic-right-angle-weave sections that’s connected to form a lariat and embellished with netted floral components. Once again, you’ll use Pip beads as flower petals. The netted floral components punctuate the lariat–you could make a simpler necklace with just the center component, or you could layer many floral components together. 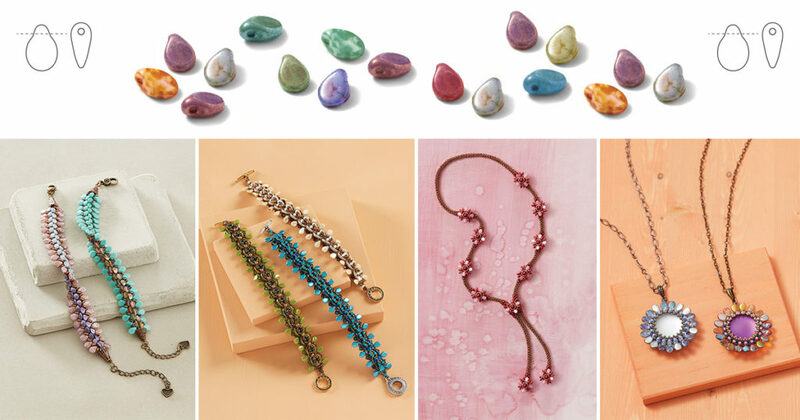 Whether you use Pip beads as flower petals or dainty dangles, they add a dramatic element to your beading stash. Combine them with other shaped beads and seed beads for maximum effect. Enjoy this little dose of springtime!